Let’s start with the basics. I'm a nurse and therefore, my mornings range from an actual morning, to my "morning" starting sometime between 1pm-5pm, depending on my work schedule and my tiredness. Let's face it, I'm sadly a night person so I have tried to implement many different morning routines that have all failed me at one point. Finally, one day my meditation teacher Sharon and I were discussing morning routines and suddenly a light bulb went off. Thanks to her sharing parts of her own routine and her navigation, I have implemented a few of her suggestions and it has been a game changer for me. These additions positively impacted my entire day, and knowing her, even briefly has changed my life. Be sure to check her out here, she was and will continue to be a huge inspiration to me and a mentor for deepening my mindfulness practice. I'll be honest, I'm human and sometimes only bits and pieces of this routine are accomplished but for the most part I am consistent. When I get it all in, oh man. My day soars. There is nothing worse than abruptly waking up to your alarm clock. Studies show it is actually unhealthy for you to be taken out of your sleep so quickly. There is a remedy for that. This may be redundant if you've read the nightly routine post already, but for those of you that haven't, I want to introduce you to the alarm clock I've been using for the past 3 years. I'm not kidding when I say I wake up in a better mood because of an alarm clock. . If you take nothing else from this post, take this. It is called Seep Cycle. It essentially it gives you a 30 minute window from when you actually need to wake up by waking you up gently with an alarm that starts soft and gets louder. If you have to wake up at the latest at 0830, The alarm will go off somewhere between 0800 and 0830. The app tracks your motion as you sleep because you place the phone under your pillow while it is plugged in. The alarm goes off when it senses you’re most awake based on the amount of movement you're creating so the more movement you have, the less likely you are to be in REM sleep and the more likely you are to be to be more awake. This is when the alarm begins to go off and you are gently woken from your slumber with a soft alarm sound of your choosing that gradually gets louder instead of being abruptly disturbed. 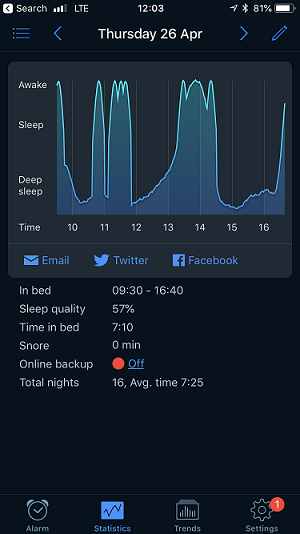 What is cool about the app is it tracks your progress and quality of sleep. You can even add notes to it to see patterns. For my morning routine, give yourself at least one hour or more than what you need to get ready and be out the door. So, If you normally get up at 0630 to get ready and make breakfast, you will probably want to set your sleep cycle alarm anytime between 0500 and 0530. Allow 30 minutes to do WHATEVER it is you want. Maybe you want to meditate, cuddle with the cat, browse the web, plan your day, call a friend, do yoga or read. Hell, maybe you want to go back to sleep. Most of the time I stay off of my electronics and opt for something I know will properly set the tone of my day. I actually set a timer for this, and once it goes off, I move on. Spend 10 minutes picking up your place, be it your room, your kitchen or your bathroom. Set a timer, and move on. This is where I look at my impending to do lists to plan the day a little. We always tend to put off the little tasks because they don’t take a lot of time and before you know it, you’re stuck with 15 items and time is something you don’t have. Therefore, start looking at your list and begin tackling all the things that would take less than five minutes—maybe it’s an appointment to make, an email to send or something else. If something is not open and I need to make a call, I make a note and I'm sure to do it later. Within ONE HOUR of being awake, you have already practiced self love, cleaned your place and tackled a few items on your to do list. (insert applause here). If your sleep cycle alarm woke up earlier, hey, you have just gained extra time in your day! How are your going to spend it? I like to start my day start my day by having a cup of something warm. Usually it is a variation of lemon water and sit quietly with it when I wake up. Sometimes I do this with my "30 minutes" other times I don't. It is best to drink it on an empty stomach, but if I'm unable to sit quietly or already ate, then I toss it in a reusable cup and get on with my day. Lemon water is an excellent way to gently detox the body and alkalize the blood (yes, it acts as an alkaline once it is digested despite it's acidic properties as is) Alkalizing foods are thought to promote better health and protection against illness. Lemons themselves act as a gentle diuretic to flush out toxins from our organs, provide us with antioxidants to fight free radicals, give us vitamin C and boost our mood and energy. By adding Cayenne pepper, turmeric, mint, ginger or apple cider vinegar to your lemon water, you can seriously amp up this drink. Cayenne will stimulate your metabolism, turmeric is great for memory and is an anti-inflammatory, ginger and mint are excellent for digestion, and apple cider vinegar? Don't even get me started on those benefits, they're seemingly endless. All of these little additions are great for immune support too. I usually try to add some uplifting vibes into my day by listening to podcasts on personal development or music that really, really puts me in a good mood. I'm talking the music that creates the can't stop, won't stop kind of groove. Sometimes I do this in the shower and save my mindful focus for something else, other times I may do this while I'm cooking or driving. One of the things I'm always pretty consistent about is adding mindful focus in the morning. (I also try to do this throughout the day) I take a normal task and become fully present and aware of what I'm doing. It is typically a hygiene task like brushing my teeth, washing my face or taking a shower, but sometimes it is making or eating breakfast or driving. Other times it is taking a moment to observe what is outside my door when I leave my house. In those moments, I try to keep my attention geared to what I'm experiencing, what body sensations I feel, what I hear, what I see, what I smell, and what I may even taste. I try to keep this focus for the duration of the task. Another aspect I try to add somewhere in the start of my day is just a few minutes of conscious breathing. If I'm able to sit still with it, great, otherwise sometime in the process of the morning I will consciously breathe for a few minutes. Then do whatever I need to do. If I need to get ready for work? Sure, I get on that. Do I need to make lunch or breakfast? Yep, Done. Am I packing to go on a hike? Oh! don't forget the snacks. Am I going to jump in the shower? Great, how much time do I have? My mornings are not consistent, and sometimes they are a bit rushed because night shift life is hard. However, implementing a little routine that still allows for flexibility REALLY helps me feel centered when things become chaotic. I'm human, and of course sometimes none of this happens and I just get out the door as quickly as possible. But for the first time in my life I have found a morning routine that works great for me. Oh, and and where do I even get this so called “to do list” ? Simple. Check out my nightly routine post. Let us know if you decide to implement any of this into your morning or if you have any other routines you hold near and dear to your heart, we would love to hear from you!